George Frideric Handel (February 23 1685 - April 14, 1759) was one of the greatest composers of the late baroque period and, during his lifetime, perhaps the most internationally famous of all musicians. Handel was in Hallé, to a family of no musical distinction. His own musical talent, however, manifested itself so clearly that before his tenth birthday he began to receive, from a local organist, the only formal musical instruction he would ever have. Although his first position, beginning just after his 17th birthday, was as church organist in Hallé, Handel's musical predilections lay elsewhere. Thus, in 1703 he traveled to Hamburg, the operatic center of Germany. Here, in 1704, he composed his own first opera, Almira, which achieved great success the following year. Once again, however, Handel soon felt the urge to move on, and his inclinations led him to Italy, the birthplace of operatic style. He stopped first at Florence in the autumn of 1706. In the spring and summer of 1707 and 1708 he traveled to Rome, enjoying the patronage of both the nobility and the clergy, and in the late spring of 1707 he made an additional short trip to Naples. In Italy Handel composed operas, oratorios, and many small secular cantatas. He ended his Italian sojourn with the spectacular success of his fifth opera, Agrippina (1709), in Venice. Handel left Italy for a position as court composer and conductor in Hannover, Germany, where he arrived in the spring of 1710. As had been the case in Hallé, however, he did not hold this position for long. By the end of 1710 Handel had left for London, where with Rinaldo (1711), he once again scored an operatic triumph. After returning to Hannover he was granted permission for a second short trip to London, from which, however, he never returned. Handel was forced to face his truancy when in 1714 the elector at Hannover, his former employer, became King George I of England. The reconciliation of these two men may well have occurred, as has often been said, during a royal party on the River Thames in 1715, during which the F Major suite from Handel's Water Music was probably played. Under the patronage of the duke of Chandos, he composed his oratorio Esther and the 11 Chandos Anthems for choir and string orchestra (1717-20). By 1719 Handel had won the support of the king to start the Royal Academy of Music for performances of opera, which presented some of Handel's greatest operas: Radamisto (1720), Giulio Cesare (1724), Tamerlano (1724), and Rodelinda (1725). In 1727 Handel became a naturalized British subject; in 1728 the academy collapsed. He formed a new company the following year. Forced to move to another theater by the Opera of the Nobility, a rival company, in 1734, he continued to produce opera until 1737 when both houses failed. Handel suffered a stroke and retired to Aachen (Aix-la-Chapelle) to recuperate. In 1738 Handel, as determined as ever, began yet another operatic endeavor, which ended with his last opera, Deidamia, in 1741. During the 1730s, however, the most important directions taken by Handel were, first, the composition of English dramatic oratorios, notably Athalia (1733) and Saul (1739), and, second, the surge of instrumental music used in conjunction with the oratorios, including some of Handel's greatest concertos – the solo concertos of Opus 4 (1736, five for organ and one for harp) and the 12 concerti grossi of Opus 6 (1739). In 1742 Messiah, the work for which he is best known was first performed in Dublin. Handel continued composing oratorios at the rate of about two a year, including such masterworks as Samson (1743) and Solomon (1749), until 1751, when his eyesight began to fail. 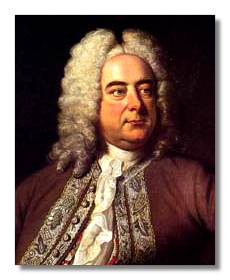 Handel died in London on April 14, 1759; the last musical performance he heard, on April 6, was his own Messiah. Throughout his life Handel avoided the rigorous contrapuntal techniques of his compatriot and exact contemporary Johann Sebastian Bach and achieved his effects through the simplest of means, trusting always his own innate musicianship. The music of both composers, however, sums up the age in which they lived. After them, opera took a different path; the favorite baroque genres of chamber and orchestral music, trio sonata and concerto grosso, were largely abandoned, and the development of the symphony orchestra and the pianoforte led into realms uncharted by the baroque masters. Thus, their influence cannot be found in specific examples. Rather, Handel's legacy lies in the dramatic power and lyrical beauty inherent in all his music. His operas move from the rigid use of conventional schemes toward a more flexible and dramatic treatment of recitative, arioso, aria, and chorus. His ability to build large scenes around a single character was further extended in the dramatic scenas of composers such as Wolfgang Mozart and the Italian Gioachino Rossini. Handel's greatest gift to posterity was undoubtedly the creation of the dramatic oratorio genre, partly out of existing operatic traditions and partly by force of his own musical imagination. Without question, the oratorios of both the Austrian composer Franz Joseph Haydn and the German composer Felix Mendelssohn owe a large debt to those of Handel. He was one of the first composers to have a biography written of him (1760), to have centennial celebrations of his birth (1784-86), and to have a complete edition of his music published (40 volumes, 1787-97) – Ludwig van Beethoven cherished his set. Although today, as in the 19th century, Handel is best known for only a few of his works, such as Water Music and Messiah, more and more attempts are being made to bring his other compositions, especially his operas, to the public acquaintance. Handel's rich and unique musical genius deserves to be remembered in the extraordinary fullness of its entirety. Concerto for Organ "Cuckoo and Nightingale"